This may seem odd, but at least three times a week, strangers tell me their secrets. When I meet a new veteran or military spouse in my office for the first time, I know very little about them. They know very little about me. Okay, in this digital age, they likely did their homework, and googled me, or asked someone about me. And I likely got some preliminary information about them. I’m certain about some things. Their connection to the military is a given, considering the work that I do. There is a desire to get help with whatever their problem is. Outside of those very limted circumstances, there is little that we know about each other, though. And, yet, they talk. Maybe it’s because I’m a therapist, and that’s what you do with mental health professionals: talk. 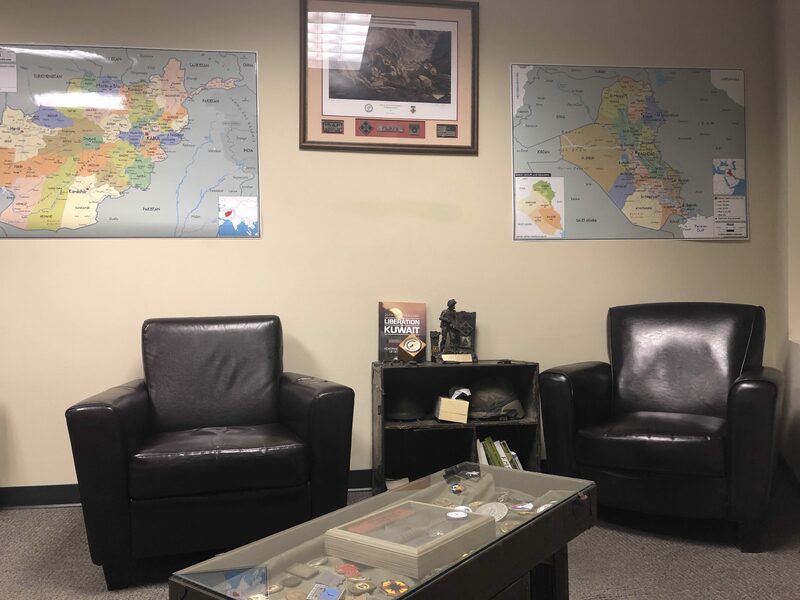 Maybe it’s because my office looks like the picture above, because that’s what it does look like: maps on the walls, coins on display. And, maybe, it’s because when a veteran finally finds someone who is willing to listen to their story, they’re ready to tell it. There is something very liberating in unburdening ourselves of our thoughts. I’ve heard variations on a theme: “it feels like a weight has been lifted.” “It feels better getting it out.” Why to strangers, though? Why to a therapist, or a faith leader, or a friend? Why does that sometimes feel better than sharing it with those that are closest to us? It’s not that our families don’t care for us, because they really do. It might have a lot to do with the fact that they care for us very much, and the independent observation of an individual with less emotional connection to us is more objective than the observations of those closest to us. The psychological concept of Expressed Emotion is defined as a “measure of the family environment that is based on how the relatives of a psychiatric patient spontaneously talk about the patient.” This 1998 article describes that the family can express hostility, criticism, and emotional over-involvement with their loved one who is experiencing psychological symptoms. This can even be more challenging when the family sees a veteran as one way before deployments or a traumatic event, and another way after. How does this apply to a veteran struggling with symptoms of posttraumatic stress, depression, or substance abuse related to their military service? I’ve heard variations on these themes, too. “Why can’t you just go back to the way you were” is a form of expressed criticism. Blaming the problems in the family on the veteran’s behavior is a form of hostility. 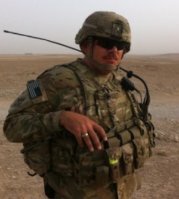 And the phrase “I would do anything to help my veteran overcome this, I would sacrifice EVERYTHING” is emotional over-involvement. I’ve even heard this from people in the community who want to help veterans…that’s where my often repeated description of veterans as “broken-winged birds and three-legged dogs” comes from. Someone actually said that to me once, that they love helping veterans, because they feel such pity for them. Wrong answer. Treatment is often not supported in families or situations where there is high expressed emotion. In other words, when hostility, criticism, and emotional over-involvement are present, the less likely treatment is going to be effective. There has to be a balance, obviously; pointing out things that are not going well is not the same thing as criticism. Expressing ourselves in an emotionally balanced way is not showing hostility. And showing concern for a veteran is not the same thing as emotional over-involvement. Like in many things, too much of this is where things start to go wrong. A veteran will often become defensive when faced with hostility, self-critical when confronted with criticism, and withdraw or resist emotional over-involvement. When we have an emotional bond with someone, our ability to remain objective is significantly in question. I, as a mental health professional, know that; I can’t be my wife’s therapist. Or my children’s. Or my father’s therapist, even though he was a Vietnam veteran. A colleague of mine, a competent psychologist who works for the VA, is also the mother of an OIF veteran. She often says, “when I talk to him, my psychologist hat isn’t even in the room. My mom hat is on all day long.” When we are emotionally close to someone, there is a greater chance that we might engage in one of the three expressed emotion domains. So how does the stranger play into all of this? Studies have shown that lower expressed emotion leads to greater chances of recovery. If a veteran is working with a mental health professional, they are hopefully not subject to criticism. If you’re getting hostility from your therapist, then it’s probably time to look for a new therapist. And the objectivity of less emotional involvement is precisely the benefit of a stranger’s ear. Mental health professionals work at developing an accepting, non-judgmental attitude regarding the clients they’re working with. I am not connected to all aspects of my client’s lives, day in and day out. A stranger has the objectivity to be able to separate themselves from the situation, and offer observations that might be more beneficial than someone who is so emotionally close. And sometimes, that objective observation is just the right thing to set us on the path of awareness and recovery.